Those lucky enough to have visited New England know this is a geographically and culturally rich and diverse area. From rolling farmlands to sparkling lakes, to scenic mountains, to amazing shorelines, and big city delights…we have it all. Our favorite family-friendly campgrounds bespeak this diversity. Whether your family is looking for a resort-like campground with all the daily activities planned ahead or a more rustic experience where you can commune with nature in a tent, RV, or cabin, you can find your perfect campground here in New England. 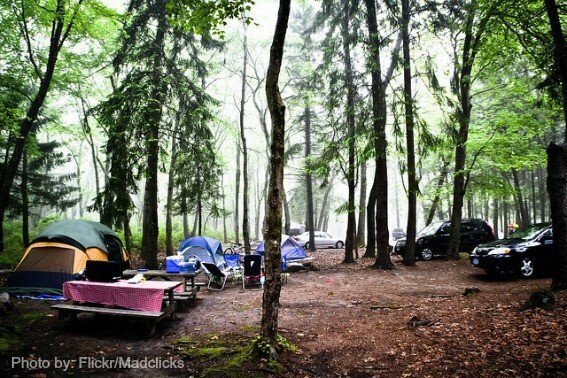 Most campgrounds are open seasonally and often fill up a year in advance. Do your homework when planning your trip. 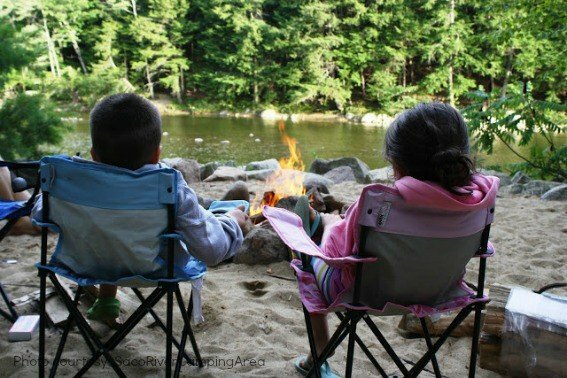 Here are our picks for the best New England campgrounds with kids. Connecticut has plenty of choices when it comes to family camping. The state campgrounds are a bit more rustic than some of the private ones and have nature as their centerpiece. Families come back to Hammonasset year after year for a shoreline camping experience. Hammonasset in Madison boasts two miles of beach on the Long Island Sound. Campers enjoy being lulled to sleep each night by the rolling waves and spend their days frolicking in the ocean. 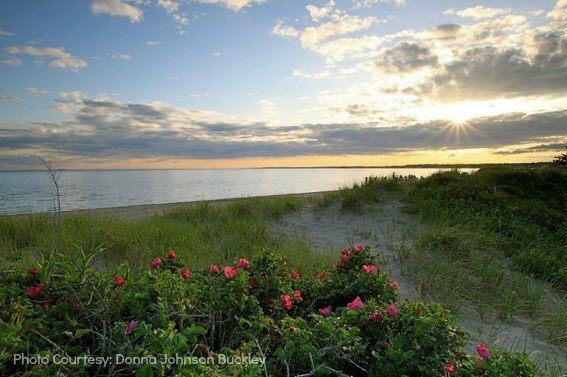 Rocky Neck State Park in East Lyme offers a similar experience with the sandy beach being the star and highlight of a stay. Devils Hopyard in East Haddam is a small campground of 21 sites where campers quickly make friends with their neighbors. Campers enjoy daily hikes on the trail and beautiful waterfalls. Impromptu movie nights with a sheet for a screen are not uncommon at this friendly camp. When it comes to resort camping there are several terrific ones to choose from in Connecticut. Lake Compounce Family Theme Park opened a new campground last year to make it easier for travelers coming from afar to enjoy the park. Bear Creek Campgrounds is located on park grounds for easy access. Here you can stay in a cabin or teepee, or bring your own tent or RV. The cabins offer separate sleeping areas and a kitchen for those looking for a less rustic experience. Odetah is located in the woodsy area of Bozrah, Connecticut nearby the eastern Connecticut attractions of Foxwoods, Mohegan Sun, and Mystic. Odetah is a 500-acre resort campground where families sometimes set up for the whole season. There are camp activities, mini-golf, swimming, Jacuzzi, and site service….like room service. The resort is set on a lake with boat rentals and water activities available. Odetah is another place families return year after year to spend quality vacation time together. Strawberry Park is another resort campground located in eastern Connecticut. Their motto is every day is a weekend! There are many family fun activities planned. Bingo, music, shows, water sports, and more are available. Theme weeks like Luau or Rockin’ Oldies are some of the highlights. Families looking for an active and planned campground will have a blast! The small state of Rhode Island is big on outdoor pursuits especially as they pertain to the water. The trip to the ocean is close to just about any town in Rhode Island! Two state-owned campgrounds in Rhode Island are very popular and very different, but each has close access to the beach. Burlingame is a large, very rustic campground on the heavily wooded shores of Watchaug Pond in Charlestown. There are hundreds of sites from primitive to full service. Campers love the beautiful pond and easy access to Charlestown’s unspoiled beaches. There are many trails; one trail leads to Kettle Pond Visitors Center where park rangers are on hand to answer questions about the hands-on exhibits. This is a very popular camp that can fill up on weekends during the summer and it may also get a bit loud, so planning is important. Similarly, Fisherman’s Memorial is a state-owned campground that is close to Narragansett beaches and the dock for the Block Island Ferry. Families enjoy tent or RV camping in the open here right near salt flats where spying on and catching critters is a favorite pastime. There are also basketball and volleyball courts, and the park is bicycle friendly. On the resort side of the camping experience is Ashaway RV Park in Bradford, Rhode Island. Ashaway does not allow tent camping unless you pitch a tent on your RV site, but for RV campers it is a terrific campground. At this newer resort, there is a swimming pool, Jacuzzi, splash pad, and game room as well as other planned activities. Whispering Pines located in the woods of Hope Valley Rhode Island provides wooded resort camping with theme weekends and many nearby attractions including the RI shore, Connecticut casinos, and an on-site, spring fed, stocked pond for catch and release fishing fun. Of course, there’s always the peaceful wilderness. New Hampshire is all about the mountains and the lakes. It’s renowned for its natural beauty and miles of meandering trails. Campgrounds here focus on nature, but that doesn’t mean visitors can’t find a more resort-like camp. No place beats Umbabgog Lake State Park in northern New Hampshire for unspoiled remote camping. In addition to full, hook up suites and cabins, this campground also has 33 sites accessible only by boat. Don’t worry about not owning a boat. Rentals are available or sign up for transportation to your idyllic site close to Maine. The park also offers a swimming beach and fishing. The Saco River Camping area is located in the more populated Mount Washington Valley. Although the grounds are close to the action of Mount Washington and the shopping, amusement parks, and restaurants, families won’t feel it at this remote campground. Campsites can be riverfront and shuttle service for kayaking or tubing down the Saco River are available. Lake Francis State Park is found on the shores of the 2000 acre Lake Francis in the Grand North. A highlight here is the nearby ATV trail system. Campers can leave the site and be on the ATV trails for the day! Though the park is rustic, visitors can still get a thrill Riding the Wilds. However, Lake Francis also offers a nature lovers quiet respite for canoeing, hunting or fishing. Outdoor pursuits will make this the place for your family. New Hampshire rolls out the red carpet for resort camping. 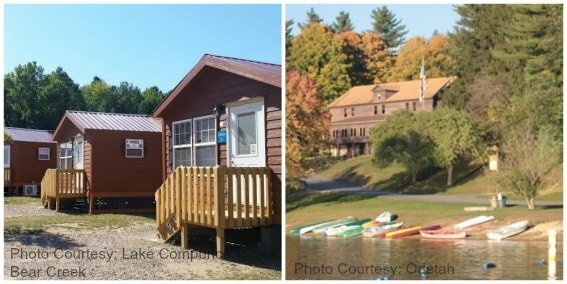 Chocorua Camping Village has all the bells and whistles of a resort campground. As a KOA campground you know this one will be one of the best. Weekly programming, game room, a pool, a dog park, a lake beach, and toddler playground all add up to family fun. Here you can stay in a cabin, RV, or tent…with outlets to keep your camera and phone charged! If you want to camp near the award-winning Santa’s Village theme park, then Mountain Lake is your choice. Tents, cabins, yurts, teepees, and RV sites are available at this campground where there are many activities to take advantage of such as hiking the White Mountains, kayaking, fishing, using the waterslide at the pool or the pirate ship playground. Also in the White Mountains, but further south is Moose Hillock Campground. Close to magnificent White Mountain hiking, Moose Hillock is a truly family friendly campground. The highlight is the Blue Lagoon Tropical Swimming pool complete with a shipwreck and waterslides; this is a child’s dream! Moose Hillock rounds out the fun with a large game room, planned activities, and weekly live entertainment. 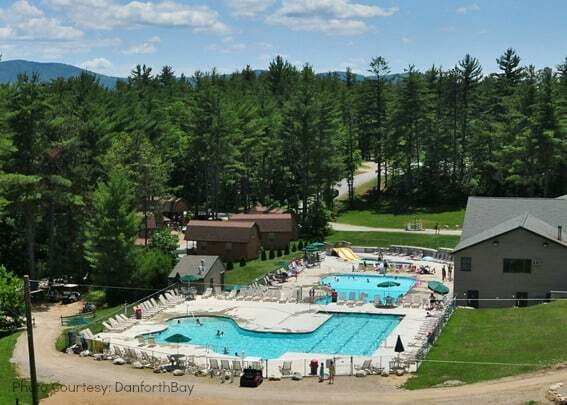 In the New Hampshire Lakes region near Ossipee Lake is the Danforth Bay Resort. This large, award-winning resort makes happy campers out of tenters and RV’ers alike. There are movie screenings, boat rentals, planned activities, a heated pool, and more. Lastly, if you want to take in the small slice of Atlantic shore in New Hampshire head for Wakeda Campground. Located a 10-minute drive from the very popular Hampton Beach, Wakeda offers family-friendly resort camping. There are planned activities like Christmas in July, the July 4th parade, mini-golf, and a game room. There is no on-site swimming, but the shore is close by for a day at the beach. Find out What’s Behind the Yellow Sign? in this KOA article. Massachusetts has it all in terms of outdoor activities. There is the beach on the rocky Atlantic shores, the mountains of the Berkshires, historical sites, and city delights. 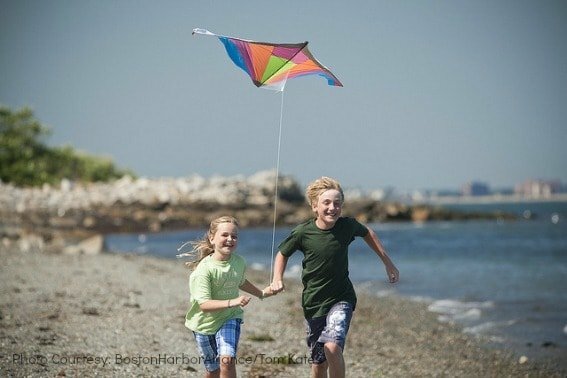 A favorite to take advantage of the area is the campgrounds at the Boston Harbor Islands. This area is composed of four islands each just a short ferry ride away from Boston. These rustic sites offer serene, natural surroundings with the shores of the city of Boston not far behind. Stay in primitive yurts or bring a tent. Activities at the islands include swimming on some, and hiking. Nickerson State Park is located on Cape Cod in Brewster. This is the place for biking and water sports. 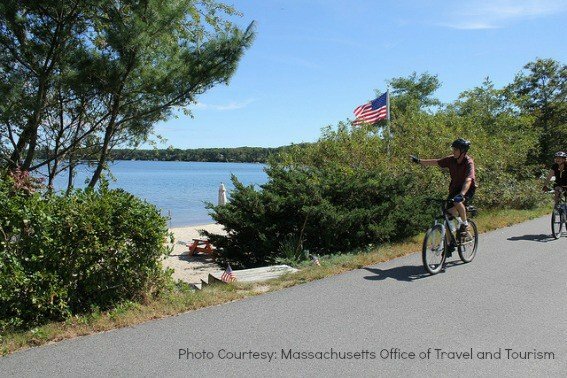 The Cape Cod bike path runs right through the park so make sure to pack the bikes. There are also areas on the pond for kayak rentals and beach play. The bayside shoreline is accessible as well. In the heart of the Berkshires and close to the Appalachian Trail is the Fernwood Forrest campground. Fernwood offers privately-owned rustic camping in the Berkshires close to the cultural activities at Tanglewood and Jacobs Pillow but also terrific hiking and sports activities at Jiminy Peak. There are weekly community activities at this family-friendly campground, which also has a small playground and volley and basketball courts. 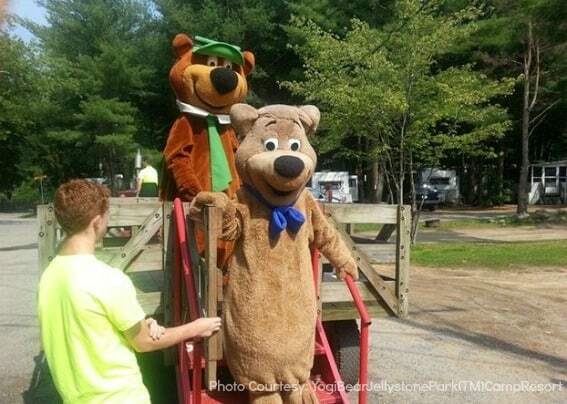 For resort camping in Massachusetts Yogi Bear’s Jellystone Park Camps provides a home away from home environment minutes from historic Sturbridge Village. There are pools, waterslides, family activities, a petting zoo, nightly entertainment that may be clowns or magicians, and a lake with rowboat or canoe rentals, swimming, and fishing. Normandy Farms in Foxboro provides luxury camping for tents and RV’s alike in a resort-like atmosphere. If your idea of camping includes amenities like massages, a fitness center, indoor pool, and guided mountain biking tours, then this is the place. There are also playgrounds, outdoor pool, disc golf, and a creative arts center. Vermont has a corner on the market of terrific family friendly state-run campgrounds. Across the state there are a variety of parks that provide different camping experiences for tenters, some even with cabin or lean to’s. Elmore State Park is perfect for camping novices and families with little ones. The sandy shores of the lake are fun for frolicking and also for kayak rentals. Families who enjoy the outdoors will love their time at this little camp on the lake with swings, snack bar trails, and friendly staff. Most enjoy a moderate hike to the fire tower and the commanding views. At Grand Isle State Park on Lake Champlain you can camp near the ECHO museum and close to Montreal. Campers enjoy biking on the flat trails, water sports like swimming or paddling, volleyball, and a play area. There are also interpretive programs scheduled during the summer. Half Moon Pond State Park provides rustic camping on the shore of a large pond. There are not a lot of activities in these parts, but if you are looking for a spot to do some hiking, swimming, paddling, or kayaking then you have found your spot. There is also an old rail trail turned hiking trail. Button Bay State Park in Vergennes offers family camping with canoe and kayak rentals on Lake Champlain, a nature center, hiking trails, and a pool and water play area. This is also a day use area. Tip: There are restrictions on numbers for the pool so keep this in mind when planning your stay. When I think of Maine, I think about craggy Atlantic shores, Acadia National Park, and lobsters! 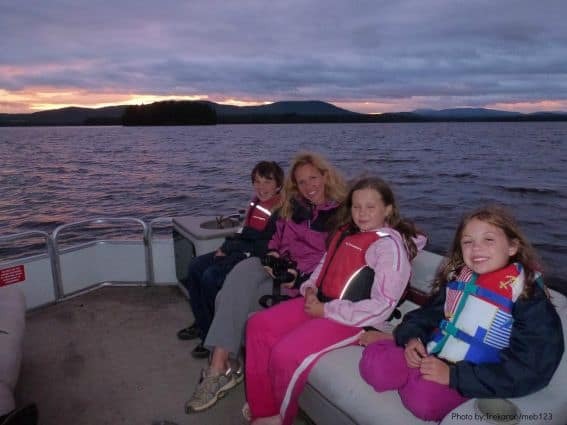 A visit to one of these fantastic Maine campgrounds will not disappoint and will likely leave families hoping for a return visit. 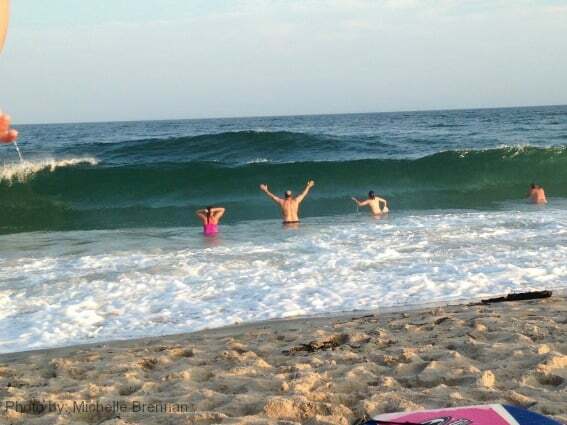 The ocean in Maine can be quite chilly, even in the summer, so a campground with a pool may be the best bet. 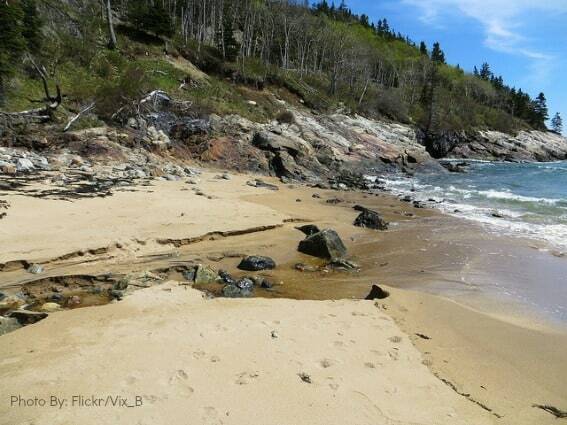 The Seawall Campground in Acadia offers rustic tent camping on the shore. These sites are primitive, yet there are rangers onsite to answer questions and provide direction about the park. It is a quick walk to the seawall and several trails, and about a 20 minute drive to the busier Bar Harbor if you are looking for some action. Plan on swimming in nearby Echo Lake rather than the chilly ocean. Make sure to try one of the famous popovers at the Common Good Community Center. On the other end of the spectrum is Point Sebago. What started out as a campground on Sebago Lake has turned into a full-fledged resort. You can still camp here, but there are many more options as well on 775 acres including cottages and lodges. There is so much to take advantage of at the resort, including a mile-long beach, golf course, daily entertainment, mini golf, and a 90 passenger cruiser. As an even bigger bonus, children’s programming is provided. 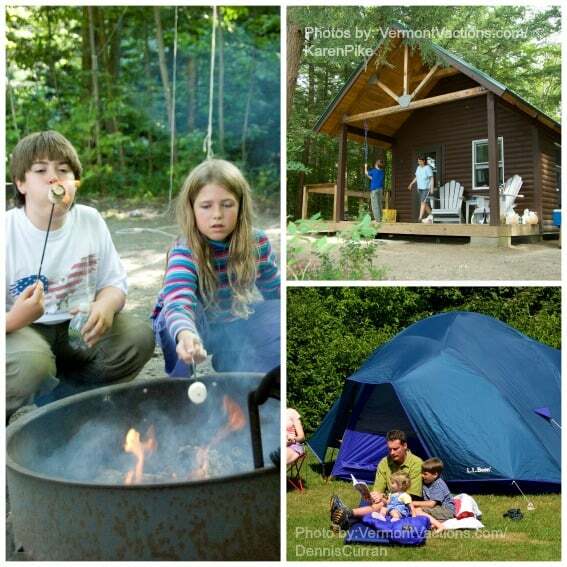 Bayley’s Campground in Scarborough is near the ocean and full of family fun activities. Kids will enjoy the onsite pool and playgrounds. There are also organized activities like capture the flag and scavenger hunts. There are fishing ponds and an accessible estuary for kayaking. Lastly, there is a KOA camp near the ocean in Maine. The Saco/Old Orchard Beach KOA is four miles from the beach but has its own pool and activities including basketball, volleyball, and scavenger hunts. Nearby are the Freeport shopping attractions including L.L. Bean, Splashtown Water Park, beaches, lighthouse tours, whale watches, and of course lobster restaurants. In New England, variety is the spice of life and our New England family campgrounds are proof of that. Whether families are partial to ocean, mountains, lakes, nature, or luxury they are certain to find a campground that fits their style. Now, this is the new place that can have some camps. Good place. You’ll find an informative heritage museum, a variety of shops, wild beaches, and plenty of wildlife to view including herons, seals, and porpoise. At night, you can try the local film nights, go to frequent music events, or view the numerous sporting events on the island.